Toyz is a major star in esports, but HKES says that he illegally broke his contract with them. Kurtis ‘Toyz’ Lau Wai-kin, a League of Legends (LoL) Season 2 World Champion and former captain of the Taipei Assassins, has cut ties with Hong Kong Esports (HKES) in a public statement issued on Monday. The 23-year-old said he has faced many “differences in cooperation” with HKES CEO Derek Cheung ever since he joined the esports company in 2013. That year, he said, the company exaggerated the severity of his wrist injury in a post on his fanpage against his wishes, claiming that he was unable to play competitively when it was “just a normal office injury”. He added that the post accused Garena, the company that organises the Garena Premier League, for being indifferent to his injury. That incident was just “the tip of an iceberg”, and Lau said he decided to leave the company in August 2015. Two months later, they had agreed on a departure fee. However, Lau said the fee was raised four times to an amount that he could not afford. “I regrettably came to the conclusion that Mr. Cheung may not care most about money, but whether my career [as a professional esports player] would survive,” he said. According to Lau, negotiations for the settlement ended to no avail on April this year. In May, he joined Taiwan’s Ding Yue Holding Group to form his own team, Raise Gaming, and has begun streaming again. 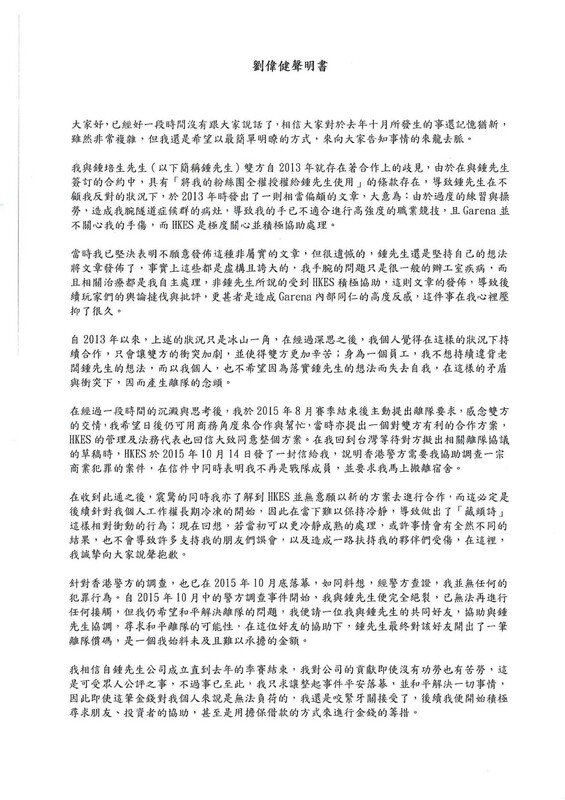 HKES issued a statement on their Facebook page on Monday evening denying Lau’s allegations. It said it had never forced Toyz to disclose any misinformation. 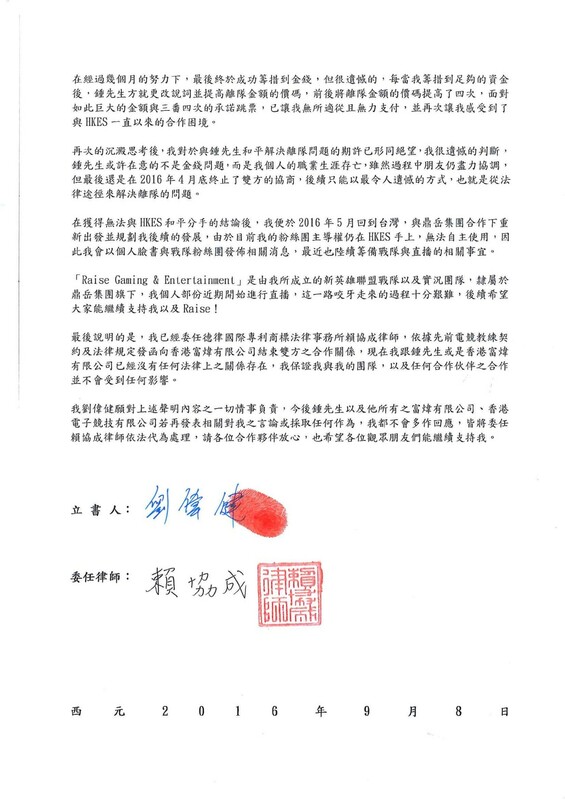 “At the end of 2013...Toyz did not want to join Hong Kong Attitude, the team at the time...The main aim of the post was that Toyz hoped to delay playing competitively until he found suitable teammates,” went the statement. Sharing links to the relevant posts mentioned, HKES said it had never attacked Garena. “We don’t understand why Toyz would twist the post’s meaning so far from the truth, deepening the strife between us,” it said. It maintained that it had never reached a settlement with Lau regarding his departure, and that Lau was still its legal employee. HKES may launch a lawsuit against Lau for the harm he has caused to their reputation. Cheung also posted on his personal Facebook page a Chinese idiom suggesting that he thought Lau was overestimating himself. This is not the first controversy that HKES is involved with. In 2015, it was charged a $48,300 fine for deliberately losing against Taipei team Midnight Sun Esports.